HCM City (VNA) – Tran Thi Tuyet Nhung, 55, had suffered pain for two months earlier this year before she decided to visit Binh Chanh District Hospital for treatment. After an X-ray was taken, doctors at the hospital’s traditional medicine ward told her she had sciatic nerve pain and prescribed 10 acupuncture treatments and several herbal concoctions. By the end of treatment, she no longer felt pain. Nguyen Thi Lam Thao, the head of the ward, said that patients like Nhung were benefiting more and more from both traditional and modern Western medicine treatments. The use of medical tests like X-rays with traditional medicine treatments is being used at many hospitals in Vietnam. “Patients with cerebrovascular disease, for example, are given herbs to increase the circulation of blood to the brain and physical therapy to help the patient move normally after a diagnosis based on modern tests by hospital doctors trained in Western medicine,” she added. “If patients have high blood pressure or blood sugar, they are sent to the hospital’s General Medicine Ward where they will be given Western medicines to help control the problem, which are better than herbs,” he added. However, after the blood pressure and blood sugar levels become stable, herbs are given to prevent further problems, Son said. “Herbs help reduce harm caused by western medicine used by patients for a long time. This combination increases quality of treatment for patients,” he said. Pham Vu Khanh, Head of the Traditional Medicine Management Department under the Ministry of Health, said the combination of Western and traditional medicine began in 1945 in the country to provide better primary healthcare. But it remained underused. In 2014, the Ministry of Health launched an action programme that called for traditional medicine wards at general hospitals at all levels (district, city, state). The wards act as advisors on traditional medicine treatment to hospitals’ top managers and directors. According to a HCM City Department of Health, the city has 10 general hospitals with traditional medicine wards and 22 out of 23 district hospitals have set up a traditional medicine ward. District 1 Hospital is the only hospital in the city with a team specialising in traditional medicine. Although 89 percent of general hospitals in the country have a traditional medicine ward, Khanh said that was still not enough. He said many local authorities had not recognised the importance of traditional medicine and had not incorporated the practice in their healthcare service policies. “The combination of traditional medicine and Western medicine helps reduce complications. For instance, a woman who has a urinary retention after delivering her child can be treated with acupuncture. The modern treatment for the condition such as bladder drainage, urethral dilation and urethral stents could cause complications, including infection,” he said. According to the Health Department’s report, the number of patients treated with traditional medicine only or a combination of Western and traditional medicine at district-level hospitals and health centres last year increased by 6.2 percent compared to the figure in 2010. Besides public health facilities, private hospitals and foreign clinics are also using the traditional/modern medicine combination. For instance, the privately run American Chiropractic Clinic in the city combines physical therapy with chiropractic medicine and acupuncture to treat back, knee and neck pain and other problems. 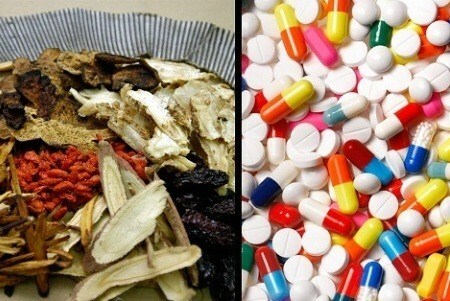 Khanh said that traditional medicine doctors had improved in both quality and quantity. “Many of them are very good,” he said, adding that universities of medicine and pharmacy offer a major in traditional medicine. In addition, students majoring in Western medicine take courses in traditional medicine to broaden their knowledge and capabilities. Son said that more and more doctors now have combined training compared to two years ago. For instance, his ward has seven doctors trained in both fields. The country is also rich in a variety of herbs, which are usually produced in caplets or small bags for patients to use easily. However, only 10 drug companies produce herbal products, so hospitals have a limited choice when bidding for products, he said.